I don't think I showed you this book yet. I reviewed it a little while ago, but it's so small and inconspicuous you'd hardly know it had even been published. For your consideration. That's the author on the right, by the way. This year I am attempting to determines the best children's books of 2006. This is simultaneously lovely and heartbreaking. After all, who am I to say that one book is any better than another? Picking the best books means making a lot of tough decisions. Until now, however, I thought I was doing pretty well. Books could be perfectly separated into two categories: Good and Bad. The good books (like "The Loud Silence of Francine Green" and "The Palace of Laughter") do something different and will be enjoyed by child readers. Bad books (like "Emily Windsnap and the Monster From the Deep") are poorly written or uninteresting. Then I got to "The Book of Everything". I hold this book in my hand right now staring at its brilliant cover art, remembering its simple but deeply cutting wordplay, and I haven't a clue what to do with it. On the one hand, it's brilliant. An incredibly intelligent treatise on one boy's grasp of what he wants out of his life, his religion, and his abusive family situation. On the other hand I can't figure out if it's really a kid's book. Would children enjoy it? Wouldn't a teenager get so much more out of it? And if I approve of it, will I just be yet another children's librarian who bulldozes her own preferred books over the objections and cries of her child patrons? There is no doubt in my mind that Kuijer's book deserves all the accolades it receives. There is considerable doubt as to whether or not children will like it. Thomas is not your average child. He's the kind of kid who sees tropical fish swimming in the canals of 1951 Amsterdam. Or frogs conglomerating on the streets outside his home. But Thomas is not happy. His father is an overbearing religious figure who aligns himself with the Old rather than the New Testament. He has no sense of humor and, worst of all, he hits Thomas's mother. When the boy befriends the neighborhood "witch", things start to look up. She lends him books. She knows what's going on in his family. And when he tells her that what he wants to be when he grows up is happy, she tells him, "And do you know how happiness begins? It begins with no longer being afraid". God may be dead to Thomas, his father reduced to a pitiful and pitiable old man, but happiness is something achievable when you've the support of women, friends, and children. At the moment that Thomas is being spanked by his father with a wooden spoon and with every thwack comes to think that God is dead, well that sort of elevated the tale from average kiddie lit to something more. But is a book inappropriate for children simply because it twiddles with atheism and higher ideas? Of course not! I'm actually thinking aloud here. The book has plenty of scenes that kids will find interesting. Thomas's visions. The description of his witchy neighbor. The magical realism of the story and the defeat of a villain who turns out to simply be a coward. There's even a contemplation at the end of what cowardice can lead a person to. How it keeps a human being away from happiness. "The Book of Everything" is remarkable simply because it can be equally considered by both children and adults and offer in-depth thoughts and conjectures for people of every age. What books can you think of that do the same? 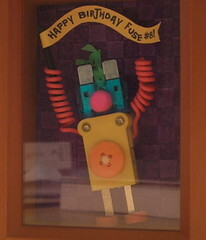 By the way, I officially declare 2006 to be the year of children's book set in the early 1950s. First I read Karen Cushman's fabulous, fun, and breathtaking, "The Loud Silence of Francine Green". Then I read Jennifer L. Holm's, "Penny From Heaven". Now I've read Guus Kuijer's, "The Book of Everything". In this book and "Francine Green" our child hero deals with religious questions and the oppressive political atmosphere pervasive after World War II. Of course, in "Francine Green" the hero was dealing with the politics of the time and giving some slight thought to religion. 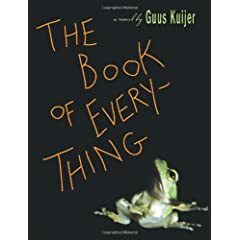 In "The Book of Everything", Kuijer's hero is dealing with his own religious understanding of the world and giving some slight thought to politics. Still, both books had frighteningly similar vapid older teenaged sisters, though "The Book of Everything"'s Margot shows an eventual and singular depth. And while I'm at it, what is it with Dutch children's books this year? First Scholastic decides Guus Kuijer is their wonder boy and then Holiday House comes out with Sjoerd Kuyper's, "The Swan's Child" (which is "The Little Prince" of the Netherlands). The Dutch are hot property at the moment, and their exceedingly intelligent children's books are just the proof in the pudding. And then there's the whole religious aspect to this book. Once Thomas starts having conversations with Jesus I had a distinct feeling of déjà vu. It finally hit me. Not too long ago another foreign import (this time from Great Britain) came to America called "Millions" by Frank Cottrell Boyce. In that book a young boy, about Thomas's age and personality, had constant conversations with saints. Thomas's own conversations with Jesus are quite similar in tone. In the end I'm going to have to say that just because a book is written with depth, intelligence, and pluck, that is no reason to punish it. After all, there's plenty of story and information here that kids will find interesting to read about. It's a slim little novel, really, and doesn't take long to get through. And the story and characters will prove interesting to young readers. The ideas in the story may sail over young heads and the nature of Thomas's internal dilemma may take many repeated readings, but it's a remarkable little story and well worth a look-see. After much consideration, I recommend "The Book of Everything" to any child with more than a drop of measured thought swirling about in their heads.